In addition to herbs, our garden doesn't warrant much harvest (though we are currently excitedly waiting to see whether the pomegranates we have are actually pomegranates or whether they're ornamental only!) Well, there is the lemon tree I suppose, producing annual harvest of one lemon. And the orange tree that's been teetering on the brink of death for three years now. So, the only actual bounty comes from the neighbour's avocado tree. Which is why any ideas for utilizing avocados is well and truly appreciated. So far we've used them to make guacamole to go with grilled prawns and that cauliflower sushi. Then there was the "deconstructed California salad" that was so ugly I can't say I was particularly upset when I lost the photo of it after my old PC crashed. It probably wouldn't have been posted even on the blog's Facebook page where my cooking disasters usually are displayed. Just between you and me, "deconstructed" is just a fancy word for "mess". This on the other hand is such a combination that it has seen us through a couple of mornings. Initially I got the idea from a fellow blogger and I couldn't believe I hadn't thought of it myself - is there anything bacon doesn't go with? Another Finnish blogger had even incorporated blue cheese! The buttery richness of avocado works so well in a sandwich - especially together with the salty crispness of bacon. I have also made this with cold smoked salmon (photo of which sadly lost now...) which was excellent too. Though with the fattiness of the salmon and richness of the avocado you really need onion's acidity to cut through them. The best choice for this is the kind of rustic bread - such as that no-knead bread, but any loaf works just fine. Cook the bacon in the oven (200°) until crisp. Butter the bread slices on both sides and fry in the pan until crunchy and golden brown. Cut the avocado in half, remove the stone, dig the halves put of their shells using a spoon and slice. 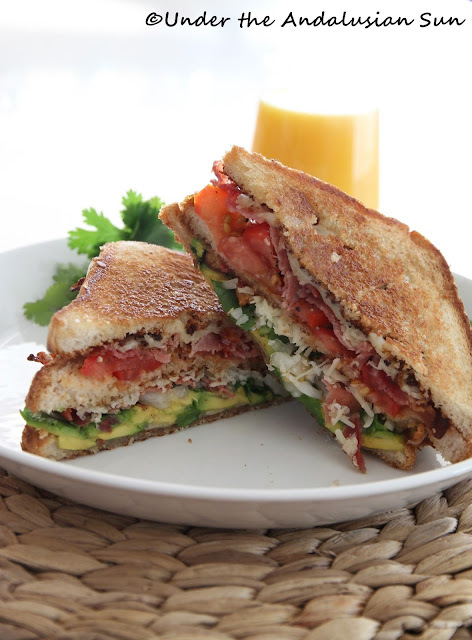 Spread the slices on the bottom half of the sandwich adding a little squeeze of lime juice on top. 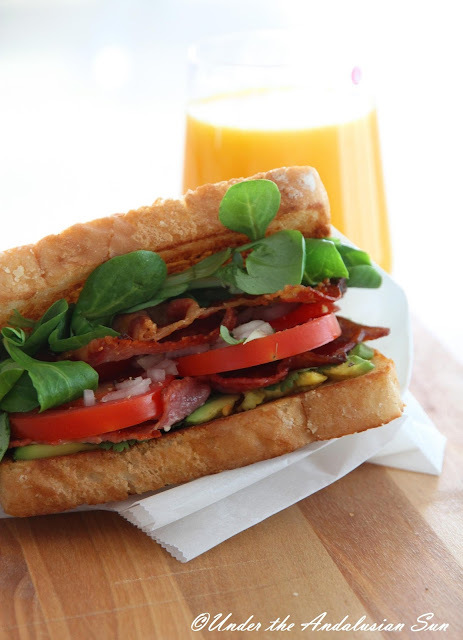 Then place bacon on top of the avocados, then sliced tomatos followed by coriander leaves and onions (and, if you want, another layer of bacon). Sprinkle some salt (carefully though as bacon is salty!) and pepper on top. Top it all off with a handful of leaves (cornsalad or mâche as it's also known is ideal) and place the other bread slice on top. Serve with freshly squeezed orange juice and buenas dias - your day's off to a damn fine start! Those who eat cheese, might want to add some. In that case butter the half that will be inside the sandwich and fry them lightly, place the fillings (along with cheese) on them and then, on medium heat (preferably covered with a lid) fry the outside of the sandwich (slowly though so cheese will have time to melt). "Best BLT I've ever had" was The Gentleman's unequivocal verdict.